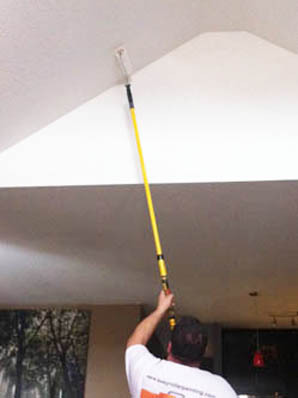 Residential painting: interior & exterior house painting; windows, doors, ceilings, trim, kitchen cabinets; basements; fences, decks, patios; garages; wood staining; wallpaper removal; stucco; foundations; pressure washing; water stain cover-up; drywall repairs eavestrough cleaning, demolition and more. See our services page. Commercial painting: offices; retail or commercial locations; apartment units or buildings; churches; interior and exterior; tenant improvements; after hours and subcontracting work accepted; to meet all needs we have extension ladders, scaffolding and a scissor lift available. See our services page.